Report Bundles is a powerful feature that lets you bundle a variety of reports together with cover pages, notes and other rich text documents, to print them all at once. This help note specifically looks at creating and managing bundles. 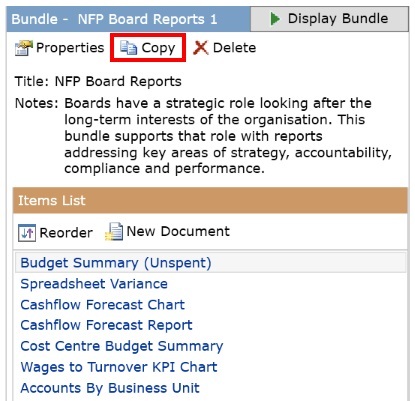 Bundle templates allow you to quickly create a bundle that includes a pre-selected set of reports and documents. Using bundle templates is a great starting point from which you can then edit and customise the content to fit your specific needs. Templates are also a great way to explore different reports or for new users to see how bundles fit together. To create a new bundle from the template gallery, click Bundle Templates. 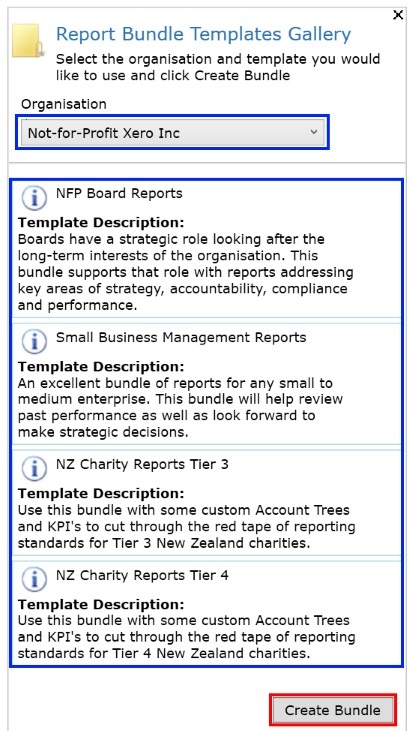 In the Report Bundle Templates Gallery select the Organisation you would like to use in the bundle, select the bundle template best suited to your purpose and click Create Bundle. 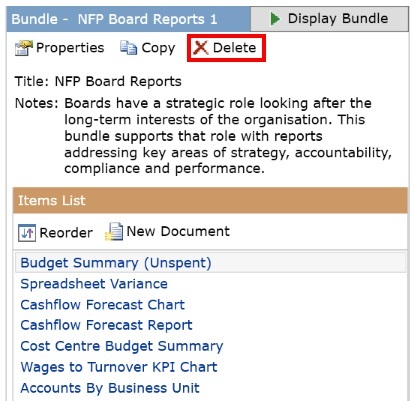 To create a new empty report bundle, that you will later add reports and documents to, click the New Bundle (Empty) button in the Bundle list column. 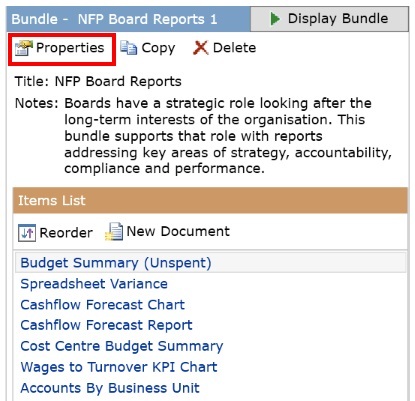 Complete the properties for a new report bundle and click OK. This is used to identify your bundles and therefore must be unique. It is also the name shown in the Bundle list. 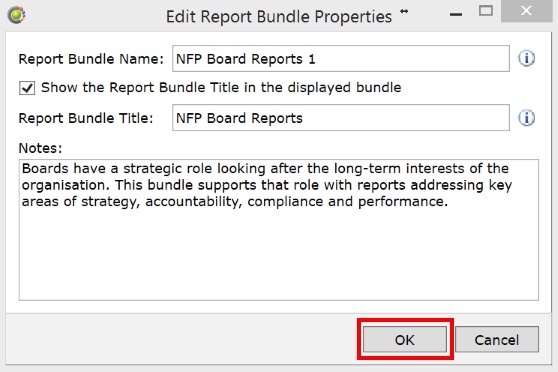 When you generate a bundle you may optionally include an overall bundle title as well as the individual report titles. This check box determines if you will include the bundle title. If the check box above is selected, then this title will be displayed at the top of the bundle. This does not need to be unique as it is not used to identify your bundle. Notes are optional but you may wish to include some notes about the intended audience and what reports are included. Adding notes here may also help other people who use this bundle. When you select a bundle from the bundle list in the first column, all the properties and actions for that particular bundle are displayed in the next column to the right. Click Properties to open the Edit Properties dialog box. Edit the required properties and click OK. Note: These are the same properties described in the previous section Create a New Bundle. Copying a bundle copies all of the bundle properties and the bundle items, to a new bundle. Click Copy to open the Copy Bundle dialog. Update to the required properties for the copied bundle and click OK. Note: These are the same properties described in the previous section, Create a New Bundle. Click Delete in the bundle details column. Please note that deleting a bundle means deleting the bundle and all of its bundled items. This operation cannot be undone. Confirm that you want to delete the bundle by clicking Yes. Type DELETE to confirm you really want to delete the entire bundle and click OK.